Design thinking has become the new design doing that is sweeping the globe. Design thinking’s impact on how organizations go about solving problems, has been profound. Design Thinking has the power to transform nearly everything. It is a human-centered approach for finding innovative real solutions to tough problems. Design thinking combines the approaches of design, management, and science to solve a wide range of difficult challenges. Design thinking can be used to develop products, services, and experiences as well as design and business strategy. Design, engineering, and business management students need to be equipped with design thinking to manage and lead innovation in organizations. There is a growing body of evidence which demonstrates that the application of design thinking to business provides greater ROI, increases employee and customer satisfaction, and creates more innovative and differentiated products and services. Chapters cover history, trends, case studies, what is design thinking, applying design thinking in your organization, design sprints, process overview, the planning phase, warming up, the discovery phase, the synthesis phase, Point of View, ideation, the prototyping phase, testing and iteration, implementation, applying design thinking to your own life, visualization, templates, glossary, dozens of proven methods, and an Index. 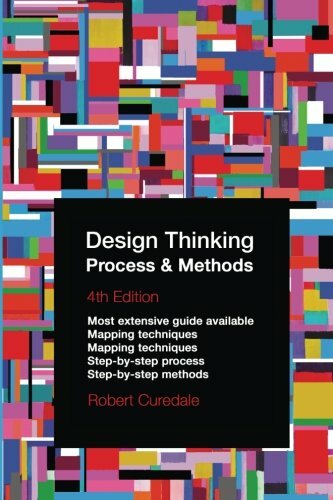 This is the 4th edition of this popular guide that is used as an indispensable reference and has been specified as a text by some of the world’s leading design schools, business schools and corporations. The author Robert Curedale has developed more than 1,000 products and services as a designer and manager working in Asia, Australia, Europe and North America, found in millions of workplaces and homes around the world. He has taught at leading international design schools and written more than twenty books related to design thinking, product design, service design and user-centered design.